Montreal lightweight John (The Bull) Makdessi climbs into the Octagon on Saturday for the 16th time. The 33-year-old Makdessi is still going strong. 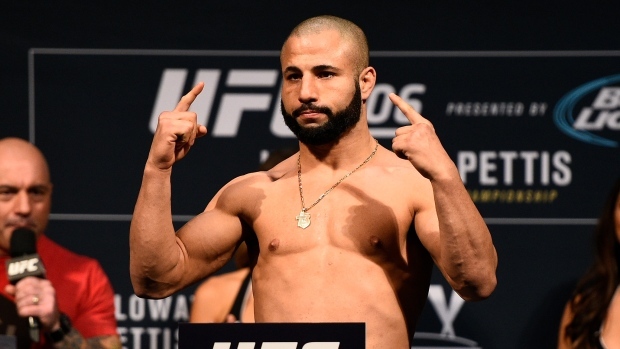 "My goal is to be one of the top Canadian fighters in the UFC," Makdessi said in an interview. "It's an honour for me to represent Canada and also my heritage — Lebanese." A longtime member of Montreal's Tristar Gym, Makdessi now trains in Milwaukee under coach Duke Roufus, a four-time kickboxing world champion. It's a lonely existence. He says for now "MMA is my wife, it's my girlfriend, it's my best friend." "All I do is watch tape and eat, sleep and train — three, four hard training sessions a day," he said. But Makdessi, who is very close to his family in Montreal, says the solo trips south of the border to work with Roufus and the likes of former lightweight champion Anthony (Showtime) Pettis and lightweight contender Paul (The Irish Dragon) Felder have made him a better martial artist. "He's a great man. Very passionate, a lot of knowledge," Makdessi, who has won two straight and three of his last four, said of Roufus. Makdessi (16-6-0) faces Peruvian Jesus (El Mudo) Penudo (16-4-1) on the undercard of a UFC televised show in Nashville. The two were paired last week after their original opponents withdrew through injury. Welterweight contender Stephen (Wonderboy) Thompson faces Pettis in the main event at Bridgstone Arena. Thompson (14-3-1) is ranked No. 3 among 170-pound contenders while Pettis (21-8-0), moving up a weight class, is the No. 8 contender among 155-pounders. While an undersized lightweight, the five-foot-eight Makdessi is an accomplished striker with a deep arsenal. He holds one of the few UFC stoppages by spinning back fist (against Kyle Watson at UFC 129 in Toronto in April 2011). But the Halifax-born Makdessi, whose record in the UFC is 9-6-0, has also been the nail and not the hammer. Taking on top lightweight contender Donald (Cowboy) Cerrone on short notice at UFC 187 in May 2015, Makdessi was forced to retire late in the second round with a broken jaw. Makdessi was giving up five inches in height and reach. And at UFC 206 in Toronto in December 2016, Lando Vannata knocked him cold with a spinning wheel kick to the head. The painful loss prompted him to sit back and review his training and the people around him. Not your ordinary fighter, Makdessi is open about the stresses of climbing into a cage and trying to knock someone out for a living. Not to mention trying to do it in an entertaining fashion. But he says mixed martial arts was "kind of my escape from everyday life." He started at six years old and says the years of training have kept him sharp and disciplined. "I feel like I'm still learning," he said. Still it's hard not to be a tough guy when your given name is John Wayne Makdessi. Makdessi has long been documenting his journey as a martial artist via a journal plus photos and video. It's a side project that has been years in the making on "the sacrifices of being a fighter." His Instagram feed is full of inspirational quotations and lessons learned the hard way. "Hopefully I can give the youth some wisdom if they decide to choose a journey as a martial artist," he said. "There's a lot to learn as an athlete and a fighter, also as an independent entrepreneur," he added. "Because you are essentially self-employed. "There are a lot of things that go behind the scenes as a fighter and I want to be a good role model for youth growing up to teach them how to be smart when it comes to picking this path. Because many fighters don't have fathers or they don't have good mentors to guide them the right way. A lot of these fighters are alone. It's a very tough sport." Makdessi is already making plans outside of fighting. He and his brother operate a supper club called Taiga Laval in Laval, Que. The Nashville card features two other Canadians. Alexis Davis, a native of Port Colborne, Ont. who now fights out of California, takes on Jennifer Maia of Brazil and strawweight Randa (Quiet Storm) Markos of Windsor, Ont., tackles American Angela (Overkill) Hill. Davis (19-8-0) is ranked fifth among flyweight contenders while Maia (15-5-1) is No. 11. Markos (8-7-1) is ranked 15th among 115-pound contenders. Hill (8-5-0) is unranked.